In yesterdays post I mentioned the Cornish tin mines so I thought that today I would write about the spirits that frequented the underground passages. According to Cornwall's tin miners along with them in the mines were the Knockers who were mischievous spirits. They both helped the miners and also played tricks on them. To keep in the Knockers good books the miners would often leave a small portion of their Cornish Pasties for these small spirits - more about Cornish Pasties later. The Knockers were the equivalent of the Irish leprechaun and were described as being about 2 feet tall, rather strange looking and lived underground. So the tin mines were a perfect habitat for them and sometimes they would be seen wearing smaller versions of miners clothes. According to Cornish folklore the Knockers were of help in two main ways. Firstly they would make a knocking sound to indicate where the tin ore veins were to be found and secondly they would knock to warn of any imminent danger. On the mischievous side they would steal tools and food, play jokes on the miners but were generally good natured. Many claimed that the Knockers were the spirits of tin miners who had died in the many accidents which happened in the early days of Cornish mining. The traditional food for Cornish miners was the Cornish pasty made from a circle of pastry filled with steak, sliced or diced potato, swede and onion, seasoned with salt and pepper. The pastry is folded in half and then baked in an oven. Note that a true Cornish pasty, as per the photo, is crimped (joined) at the side - and never on top. There was a reason for this. The miners would take larger versions of the Cornish pasty for their meal breaks and would hold this by the crimped edge with their dirty hands. This way they could discard the soiled pastry for the Knockers to eat. Sometimes the pasty would contain apple at one end. The miner would then have a complete meal of a first and second course. Going back to the Knockers these spread to the USA as Cornish miners - who became knows as Cousin Jacks - joined the Gold Rush in the late 1800s. There is a story of how in 1956 a mine was closed and sealed. Generations of Cousin Jacks insisted that the mine be re-opened for all of the Knockers to escape and move to other mines. The mine owners agreed and the Knockers were set free. 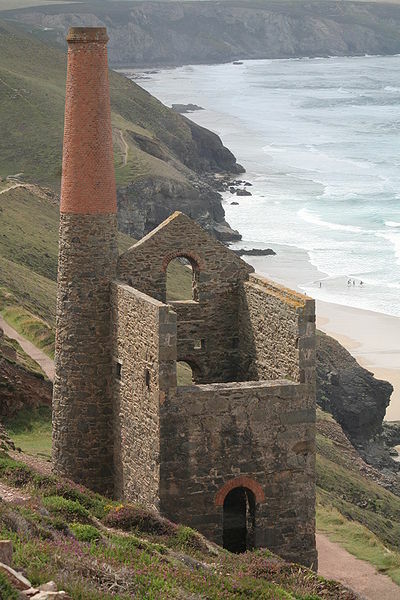 The tin mines of Cornwall are, or rather were, interlinked with Knockers and pasties. 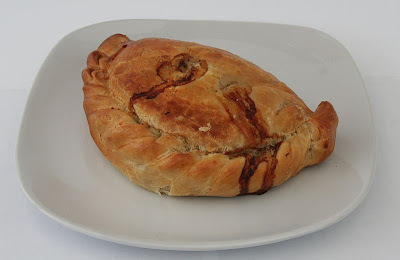 Cornish pasties thrive in Cornwall and, in Europe and the UK, Cornish pasties can only be made in Cornwall. I love pasties but, being a vegetarian, I have mine filled with vegetables or sometimes cheese, onion and potato. There is an often heard chant in Cornwall of, "Oggy Oggy Oggy," to which the reply is, "Oi Oi Oi" - the oggy being a pasty. The word is believed to have been derived from the Cornish word hogen. At the mines, when the Cornish pasties were ready to be eaten, the bal maidens would shout down the mine shaft, "Oggy Oggy Oggy," and the miners would call back, "Oi Oi Oi." I got my first taste of variations of these Cornish pasties in Oregon, USA. They are wonderful, flaky, flavorful, and satisfying. I've had both vegetarian and those with various small meat chunks but have yet to sample one with fruit on one side. Dessert included? What a treat! Cornish pasties: the true food of Cornwall plus that cream as well, of course. Love these posts about Cornwall, Mike. Tricksters! What a fascinating post. I've never had one of these pastries, but they sound delicious. now i finally know why there's a bakery chain called oggy oggy pasties!